Is there a way to visualize the package structure in the “open atelier class routine”? When selecte the menu Navigate/ open atelier class routine it shows all available classes. Duplciate classes are shown multiple times without a package structure (see example below). 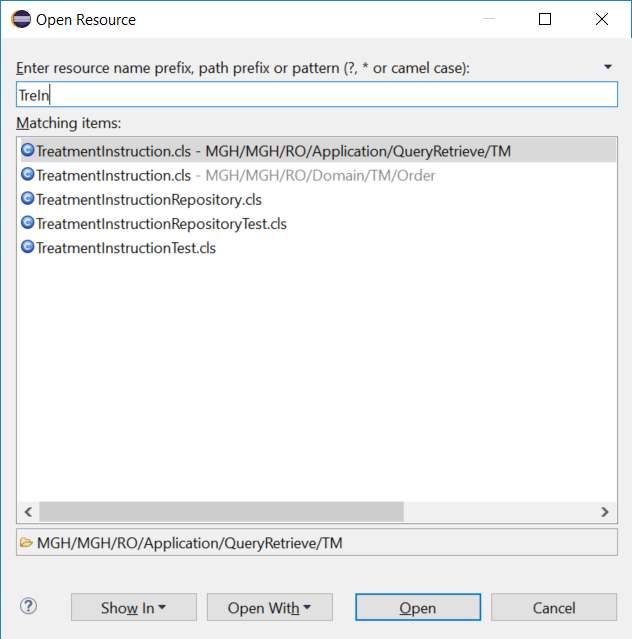 I assume you're using 1.1.391 (the latest public release), and that the " - MGH" indicates you have defined an Eclipse working set with that name and selected it (e.g. in the dropdown menu from the down-arrow on that dialog). For the benefit of others who may not have found this dialog yet, it's on the standard "Navigate" menu and also the standard toolbar (white "C" in blue circle). It apparently searches the filenames within your projects (optionally limiting this to projects in your current working set), but I haven't yet found a way to make it take the package into account in its lookup, nor to display it. I am interested to know more about the "Workspace matches" part of your screenshot. So far I haven't managed to get this on mine. 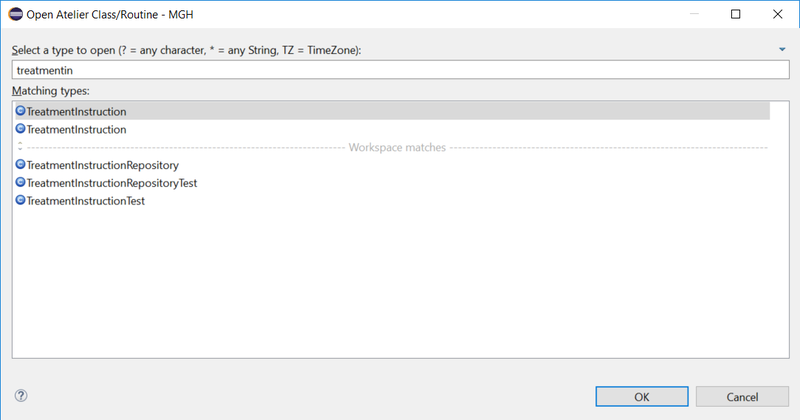 And can someone explain the rather cryptic "TZ = TimeZone" part of the dialog text? I have pressed once, accidentally, a combination of some keys and saw the package structure. So it looks like that it should be possible. The "TZ = TimeZone" is also unclear for me. packages seem to be implemented as kind of sub-directory. You see the same effect in editor pane. The package is only visible in mouseOver event. You only see the packages if you click the down arrow in right upper corner and "Edit Working Set". For "TZ = TimeZone" I googled around Eclipse and opened a can of worms. With no answer. Here's an explanation of TZ = TimeZone. Thanks, @Eduard.Lebedyuk . I newer could have guessed it. It didn't occur to me either! Interesting that the "Open Resource" dialog opted to use the term "camel case" instead. When I press ctrl + shift +r you get all Files in open projects in the workspace. 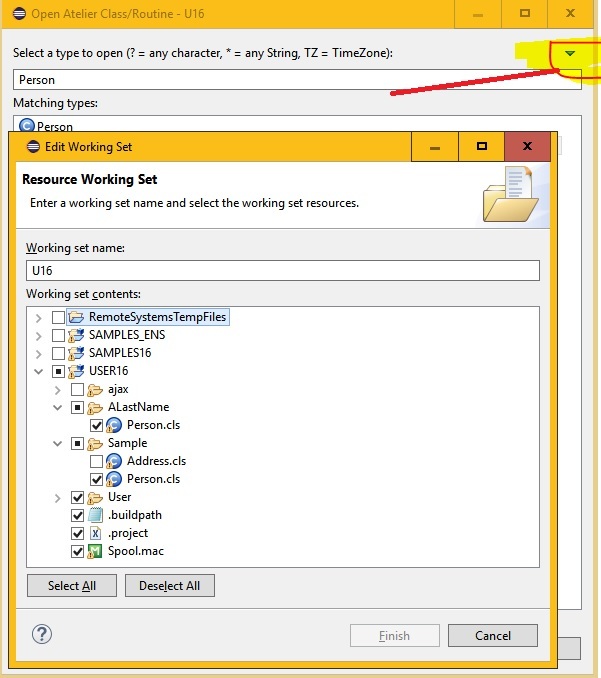 It opens the "Open resource" dialog and also shows the file structure for classes with the same name. Thanks for the tip Roger. As shown in your example, that dialog also does some clever stuff with CamelCase filters. CamelCase filtering also works in the "Atelier Open class/routine" dialog.